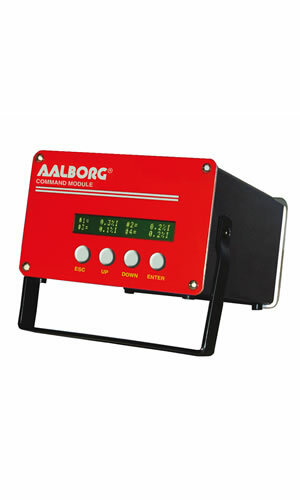 Microprocessor driven digital Command Modules are used in conjunction with any analog or digital mass flow meters or controllers with 0-5 Vdc input /output signals. It is easy to program the SMART DPROC using a logically organized, modular menu. The operator quickly accesses a desired function by branching through the multi-level tree structure, rather than scrolling through the entire menu. RS-232 serial communication interface is standard for all models and supported via a 9 pin "D"-connector on the back panel of the Command Module. RS-232 Software interface commands set allows communications with the unit using either a custom software program or a "dumb terminal" and provide complete control over all modes and functions. Optional built-in Ethernet interface allows accessing any Internet-connected SDPROC from a browser on your work station, PC, or laptop computer. Regardless of where you are, your Command Module is as close as the nearest browser! There are two levels of Ethernet based Remote Controls: HTML web server and TELNET. The HTML web server, which is hosted on the Command Module lets one view CURRENT FLOW RATE, CONTROL VALVE MODE and/or SET POINT, MONITOR TOTALIZER READING FOR SELECTED CHANNEL. The TELNET console provides complete control over all modes and functions and using the same Software interface commands set as the RS-232 communication interface. The flow set points, measured gas flow and associated totalizer data are scaled directly in engineering units via front panel keypad, RS-232 or Ethernet interface. The following units of measure are supported: %F.S., SLPM, SLPH, SCCM, SCCH, SCFM, SCFH, SCMM, SCMH, LBPM, LBPH, GRPM, GRPH. The INTERNAL, EXTERNAL, PROGRAM refers to the point of origin for the Set Point signal. In Internal reference mode, the user sets the control signal with SDPROC controls (via front panel keypad, RS-232 or Ethernet interface). In EXTERNAL REFERENCE MODE, the user sets the control signal from a remote location (via the DATA IN/OUT 25-pin "D"-connector on the rear panel). In PROGRAM MODE the set point signal will be driven by user's custom program stored in the EEPROM. There are three Program modes: BATCH, TIMER and RATIO*. *RATIO mode not available for one channel module. The Batch Flow Control allows execution of custom, user preset program of up to sixteen steps. During execution of the program the user can activate or deactivate the LOOP mode. Various flow configurations may be preprogrammed: ramping, pulsing, linearized increasing and/or decreasing of the flow. The Timer Flow Control allows execution of custom, user preset program of up to 96 steps. Each step can be preprogrammed for a particular date, time, and set point value. Every step has two fields: starting date, time and set point in % F.S. The Ratio Flow allows controlling flow of the mixture of up to four different gases (for 4 channel Command Module) with preset values of the ratio in % for each channel. The flow rate of the mixture can be incremented or decremented by changing the set point of the master channel #1. Two sets of dry contact relay outputs for each channel are provided to actuate user supplied equipment. The relays can be assigned to switch when a specified event occurs (e.g. when a low or high flow alarm limit is exceeded or when the totalizer reaches a specified value). Power Supply: 85 to 240 VAC (47 to 440 Hz); 120 to 370 VDC 2A max.